A major software update for Philips' Hue app brings an enhanced user experience to the multi-colored connected LED lighting system, granting owners location-based control of bulb settings, support for the "If This Then That" Internet automation service, and recurring "calendarized" scheduling. The new Philips Hue app, announced on Tuesday, adds a much greater level of customization to the smart LED lighting system. When paired with the Hue bridge and bulbs, the application allows iOS and Android devices to access any application programming interface on the Internet to adjust the lights. The new update allows Hue smart bulbs to act as "informational gateways," providing visual cues related to data such as weather, stock prices, sports scores, e-mail, social media and more. These settings can be customized with a new Philips Huge channel on If This Then That. Version 1.1 of the official Hue application also adds geofencing support, which allows the system to track a user's location. With this capability, the Hue can automatically turn the lights on or off when a person arrives at or leaves their home, all without the need to take the iPhone out of their pocket. The update also adds the ability to program recurring schedules to the Hue, allowing users to more easily create repetitive daily behaviors. Lights can be programmed to gradually become brighter and wake a user up, or dim at night when it's time for bed. Users can also randomize their lights with the timer function. This allows the bulbs to "organically" switch on and off when a user is away from home, making it appear to outsiders that someone is actually there. Finally, Philips has also added a new "synchronous scenes" feature that assures all Hue light bulbs change "scenes" in a smooth, immediate manner. Pre-set scenes are now stored in the bulbs themselves, eliminating the domino effect that previously occurred when multiple bulbs received a command. "People have really taken to Hue with the idea of connected lighting being a stepping stone to the connected home and in the last six months alone it has exceeded sales expectations by 300 percent," said Ed Crawford, general manager and senior vice president of the Professional Channel, Philips Lighting Americas. "We have built a vibrant, vocal community at everyhue.com and the feedback of those voices has been invaluable. The guidance given by our most enthusiastic users was a major factor in bringing our latest updates to life and we cant wait to see what they think of next." Philips Hue bulbs debuted last year exclusively at Apple retail stores as part of a limited-time arrangement. Since then, availability has expanded to other retailers such as Amazon, which now offers both the $199 starter pack and individual bulbs for $60 each. 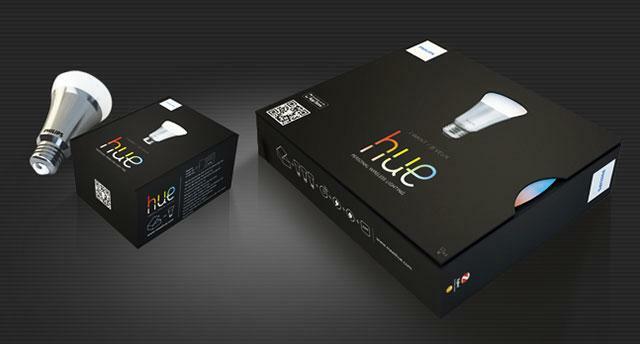 An official Hue software development kit was also released by Philips in March, allowing app makers to integrate the lighting solution into third-party products. One application that takes advantage of Hue is Ambify, a real-world music visualizer which changes the color of Hue bulbs based on the music being played from an iOS device.